Ever the businessman, the store at President Donald Trump's site has an eye on how to turn a quick profit. 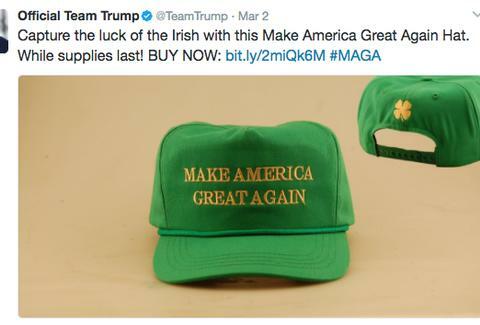 With the approach of St. Patrick's Day, it's not at all surprising they've made a St. Patrick's Day-themed "Make America Great Again" hat that comes at the middle class-friendly price of just $50. However, there's a problem with the cleverly titled "Official Make America Great Again Green Hat." It's explicitly about St. Patrick's Day, according to the store's description, but it has a four leaf clover on the back instead of a shamrock. Naturally, people noticed the error. Dustin Nelson is a News Writer with Thrillist. His sermons have frequently included references to Leprechaun, so, you know, full circle. Follow him @dlukenelson.